All eyes are on the burrow of The Living Desert tortoise. Fans are watching for when The Living Desert's own Mojave Maxine will emerge from her burrow, a move that signifies spring-like days are nigh. WHEN FEBRUARY 2 ENDS: Movie lore has it that Groundhog Day doesn't ever end -- at least for Bill Murray, for a good long time -- but we know that here, in the non-cinema world, that the second day of the second month has a way of wrapping up rather predictably, in 24 hours, which is how days tend to wrap up. That means that as much as we adore Punxsutawney Phil, his plump, toothy cute-a-tude, and impressive aptitude for noticing shadows, that merry moment, one of winter's sweetest traditions, is going to come to an ending all too soon. So what do February 3 and 4 bring if we're not scanning the channels and the sites for a sight of a certain furry meteorologist? A bit of a letdown, really, if you like animals and you like weather predictions. But hang tight, Phil fans, for there's another soothsayer of the seasons, and she's right here in California. Her name is Mojave Maxine, and as her moniker might suggest, the 38-year-old desert tortoise is based in one of our arid climes. 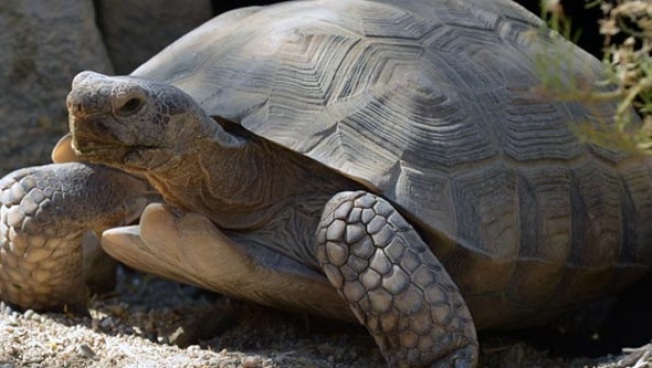 Maxine's home happens to be at the lauded Living Desert in Palm Desert, though the tortoise isn't at home to visitors at the moment. She's in her burrow, where she always is during the cooler days of the year. BUT LIKE PUNXSUTAWNEY PHIL ON FEB. 2... Mojave Maxine will make an appearance, eventually, when she's good and ready and spring, to Maxine's tortoise senses (which are just as awesome as Spidey senses), has sprung. So when will she poke her pretty face out of her burrow? That's anyone's guess, or, specifically, kindergarten through grade 12 students around Southern California. Our young scholars are invited to predict when the burrow's doors will open (well, to be poetic). The prize? A few nature-nice goodies, but, best of all, a visit from Mojave Maxine. She's a "spokestortoise" according to Joshua Tree National Park, an ambassador who regularly "travels around to teach others about her wild relatives, many of whom live in Joshua Tree." Sounds like busy Maxine's brumation -- which Joshua Tree explains is the tortoise take on hibernation -- is well-deserved. So, when will spring be here, weather buffs? Best keep eye on the sky, or, better yet, on a certain burrow Palm Desert.